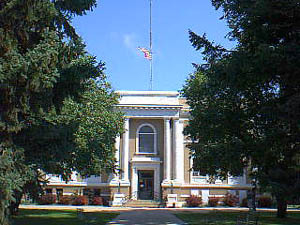 Soon after Sherman County was organized in 1873, Loup City became the county seat, primarily because of its location in the Middle Loup Valley. The Union Pacific Railroad came to Loup City in May 1886. Subsequently, the railroad companies owned over 160,000 acres of land. The sale of these lands brought many immigrants to Sherman County bringing in the diverse cultures of Polish, Swedish, Danish, German, Bohemian, English, and Scottish peoples. The population of Loup City has fluctuated over the years. It became a stopping place for pioneers who were headed for the gold fields in the Black Hills. Many left when times were hard, or because drought or grasshoppers forced them to look for other means of making a livelihood. In the first half of the Twentieth Century, Loup City prospered. By 1952 there were nearly 100 businesses in town. Through the years Loup City was known for its roller mills, which produced White Satin Flour, the Ohlsen Brickyard, Depew Disc Sharpening Company, a cigar factory, broom factory, and a pop factory. The Youngquist brothers also made Turn-a-Back Rug Racks for linoleum rolls. At present, Loup City has the G & G Manufacturing, plus Cook and Beals, which sells honey-extracting equipment around the world. Loup City has a first-rate hospital and nursing home, a clinic, community center, and a Carnegie library, recently renovated. There is also Westside Park, a low-cost housing project. A senior citizen center serves noon meals.